After I had drafted the following post I initially put it on the shelf, since the idea that the gas flares would have an impact over such a large area began to seem a bit of a stretch. But then, in the last week a new paper has been published in Nature and been commented on by both Roger Pielke Snr and Watts Up With That. Simplistically it finds that the actions of the wind turbines in Texas have caused a temperature change of 0.72 degC per decade due to the way in which the turbines modify atmospheric behavior. Wikipedia notes that Texas has an installed capacity of 10,377 MW, nameplate, and generated 6.9% of the electricity in that state in 2011. Russia has been flaring up to 50 billion cubic meters of natural gas a year. If a cubic meter of natural gas contains 37 Megajoules of energy and Russia is burning 50,000,000,000/365/24/3600 = 1,585 cu m/sec this is equal to 58,600 MW – six times the size of the nameplate Texas wind farms, recognizing that flaring goes on 24-7 while the wind turbines are much more intermittent. So it seems the topic has more validity than I might have thought, but is there an effect? 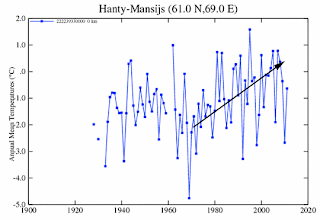 If one looks at the global temperature maps that are issued by the Goddard Institute for Space Science (GISS) there is a consistent trend in those, which indicates the much higher temperatures that are found in Northern Russia and Siberia. 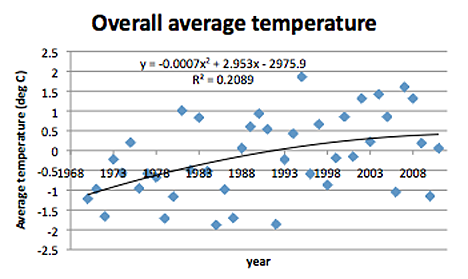 These high temperatures are a significant contributor to the overall analysis that the average global temperature has been rising for the past 40-odd years. Figure 1. GISS reported temperature anomalies for Feb 2012. Figure 2. 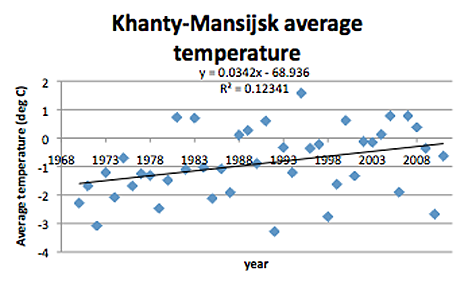 Temperatures for Khanty-Mansiysk as reported by GISS. 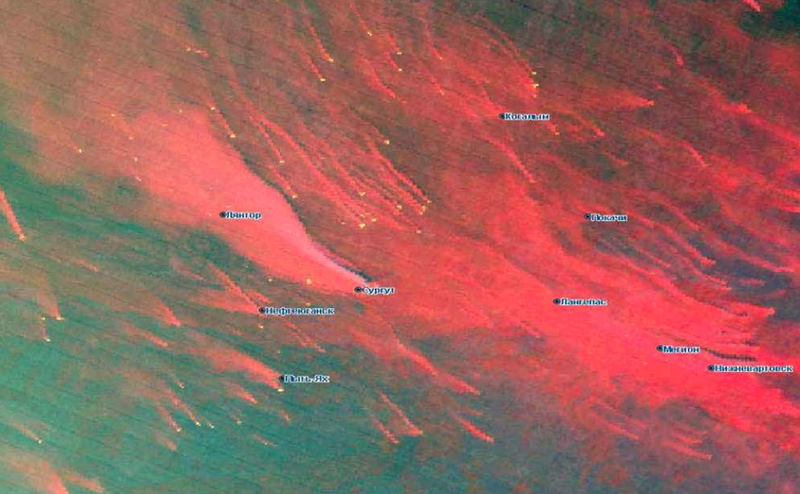 I will forego for now the adjustments that are made by GISS to the original data. 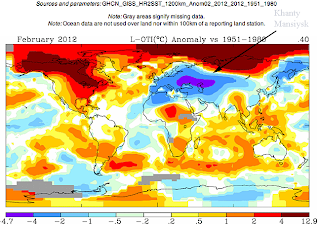 In these regions this was recently covered by Paul Homewood at WUWT and I have written similarly on the adjustments that GISS consistently makes to individual state temperatures in those posts listed to the right hand side of this page. However this got me a little curious, given that the rise in temperature shown occurs in a region where there has been a considerable amount of gas flared, as I have commented earlier. 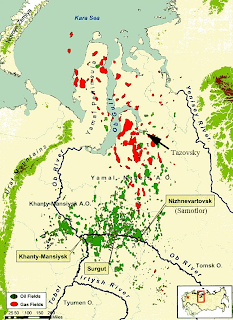 The amount is in the range of 24 billion cubic meters a year in the region of Khanty-Mansiysk alone (half the Russian total), and I have used this illustration from the world bank of the thermal plumes that they generate. In more recent times there are new fields being developed in Eastern Siberia and up in the Yamal, many of whom cannot as yet pipe their natural gas away. As a result it is still being flared, and I have become curious if we could correlate any of the increase in Siberian temperatures with the increase in Russian flaring of natural gas. So, in a way reminiscent of the work I did on US state temperatures, I have downloaded the data from GISS on the 32 stations that lie within a thousand kilometers of Kanty-Mansiysk to see what they show, Some stations have incomplete data, and so I don’t know what I will find as this post starts to look into the data set. First, just out of curiosity I took the average value for the stations over the years, and plotted it against time. While there is a relatively constant range until about 1960 it seems (just by eyeball) that the temperature starts to pick up thereafter. Which is where it is important to note that this was about the time that oil production in the region began to pick up. To re-iterate that plot from the discussion of Western Siberian production. Thus, just about the time that the temperatures in the region began to pick up, so the wells were being sunk, and the gas flared, from the production. So there is a little bit of a coincidental timing here. But that does not necessarily mean that there is any interaction other than co-incidence at this point in the story. But what it allows me to do, for the moment, is to truncate the data sets that I am looking at and confine them to post-1970. 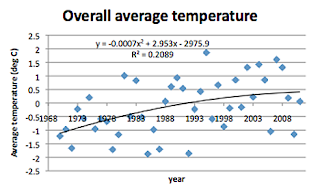 And, just for curiosity, I am going to use a 2nd order polynomial for the trend line for the overall data – to see what it might be doing other than just increasing. Now what is interesting about this is that there is a little bit of a fall-off as suggested by the trendline. This could very well be because of the sun output changing, or a variation in GHG levels – though those have continued to increase. Alternately it could also be because of the campaign by the World Bank and the Russian Government, which is causing the Russian oil companies to increasingly capture the gas and either re-inject it or pipe it to a commercial source, rather than just flaring it. (And though the number of wells is increasing as the supply diminishes the effect on gas flared is not absolutely defined). Figure 8. 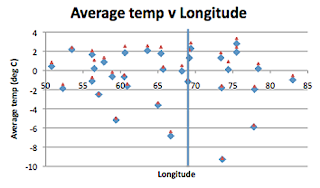 Average station temperatures (blue over the full record, red post 1970) as a function of Longitude with K-M located at the blue line. Figure 9. 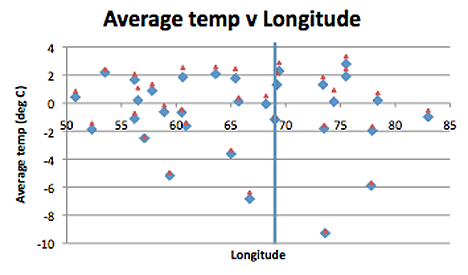 Average rate of temperature change as a function of longitude – post 1970 and with K-M marked at the blue line. 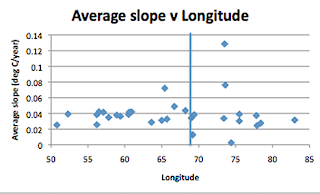 Well apart from two stations there does not appear to have been much change as a function of longitude. 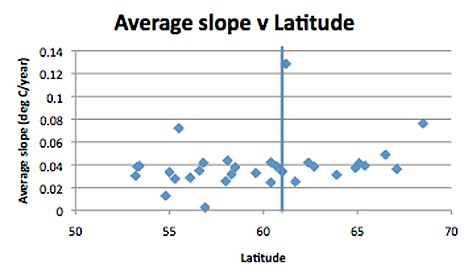 How about latitude? Figure 10. Average station temperatures (blue over the full record, red post 1970) as a function of Latitude with K-M located at the blue line. 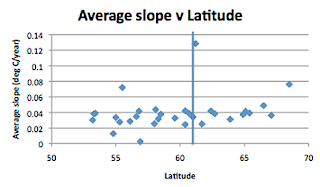 Interesting in that the average temperatures seem higher at lower latitudes than higher - which would seem to argue against the GISS graph at the start of this piece, and there is the thought that the values that I am using are post-adjustment by GISS so they may have corrected for something I have missed. Figure 11. 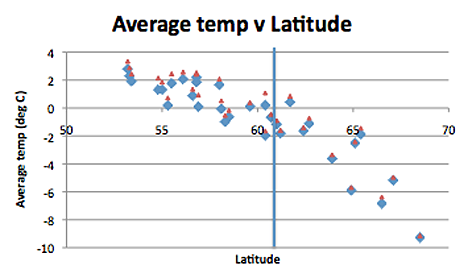 Average rate of temperature change as a function of Latitude – post 1970 and with K-M marked at the blue line. Hmm! Apart from the increase in the station almost immediately north of K-M and the slight increase in slope as one moves further North past K-M, which may or may not be significant, there is not a lot of immediately obvious answers in the data. 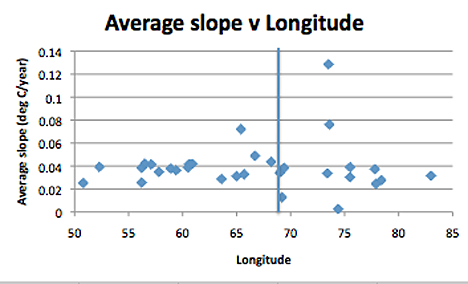 Ah, well not every conjecture works out, though I would still like to compare the raw data instead of the modified. And there is still that very dark red plume down-wind of K-M to explain . . . . . 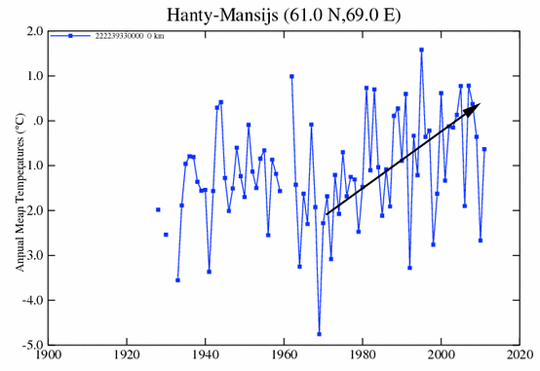 If you spend a day on WattsUpWithThat searching, you might find an analysis that he did a long time ago on Siberian temperature trends. 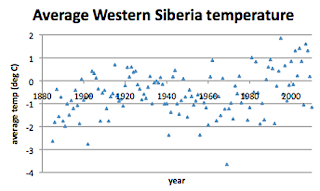 Essentially what he found (from memory), is that the number of temperature data points in Siberia fell significantly after the fall of communism. When the old thermometers were lost, the ones remaining were just assumed to represent a larger area. He surmised that the ones that were lost were more rural in nature, while the ones remaining were in bigger towns, where steam pipes run above-ground to carry heating steam to various buildings. He didn't have any proof, but from Google images he guessed that the remaining thermometers were artificially being heated. The things you can find by searching around the internet! When I was growing up in the 70's, I used to get my news by watching Tom Brokaw at 5:30pm. I can't imagine what I must have missed. Any comments on your opinion of their prospects would be much appreciated. The stock market appears to value their technology at roughly zero. 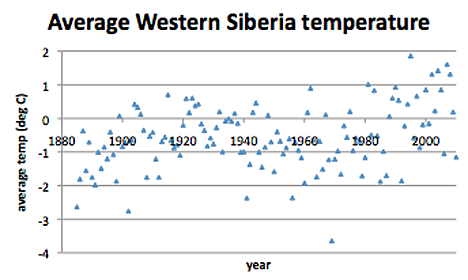 wew .. . the content of the site is very interesting. . thanks a lot for sharing it to us..
Just ran across this while searching for Siberia temperature data. Thanks.